In a previous post I asked the question if Rosetta and Philae would rekindle the public’s imagination, like comet ISON had done previously. The answer I’m completely happy to say …. is an unequivocal YES !!! The first peak in excitement came with Philae’s inital release and start of its journey down to the comets surface. Pictures release later showed a wonderful image (captured with Rosetta’s OSIRIS camera) of the fully deployed Philae lander beginning its descent to the surface. Set to be a future iconic image ….Philae just after departing Rosetta imaged by Rosetta’s OSIRIS camera. From then on, the tension just ramped up and up. did it land and whether or not it was successful? did the ice screws in the feet grip the surface? Then a little later, with many theories expounded, alternate hypotheses proposed and conjecture from all angles we found out our favourite little lander had bounced……not just once, but twice! 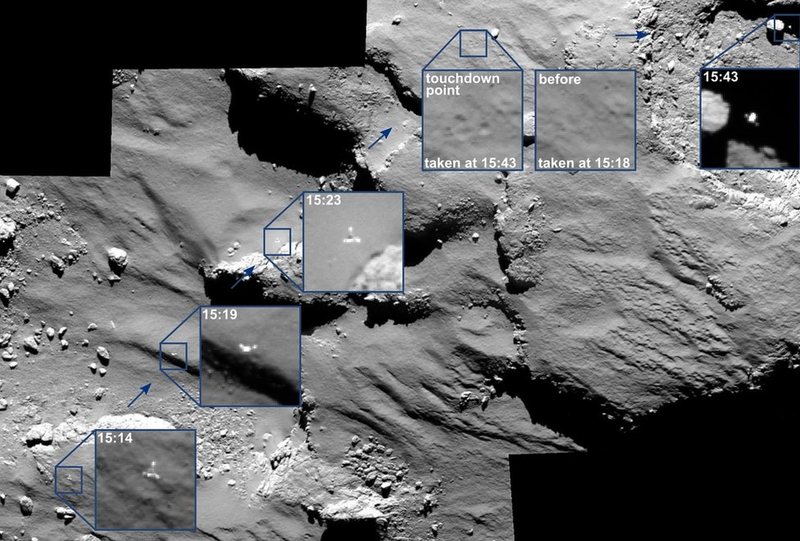 Philae’s bounce after landing and subsequent resting place. Image courtesy ESA. By this point, the social media world had gone bonkers. My own twitter feed looked like the London stock exchange ticker and I could barely keep up with the volume of posts. Not just because they had accomplished “something wonderful” (to paraphrase Dave Bowman from 2001!) by managed to successfully “soft-land” a probe on the surface of a comet 300,000,000 km from earth but that the whole world was sitting up and not only taking notice but joining in and celebrating the landmark scientific success. Just about every major news broadcast carried the landing as its lead story – just wonderful. Eventually its was discovered that Philae had settled (at the end of its second bounce) in a shaded area of the comets surface, next to a rock wall. Limited battery life, experimental processes, streaming data and the lack of sunlight to charge the lander via the solar arrays led to the inevitable end that everyone had been dreading. 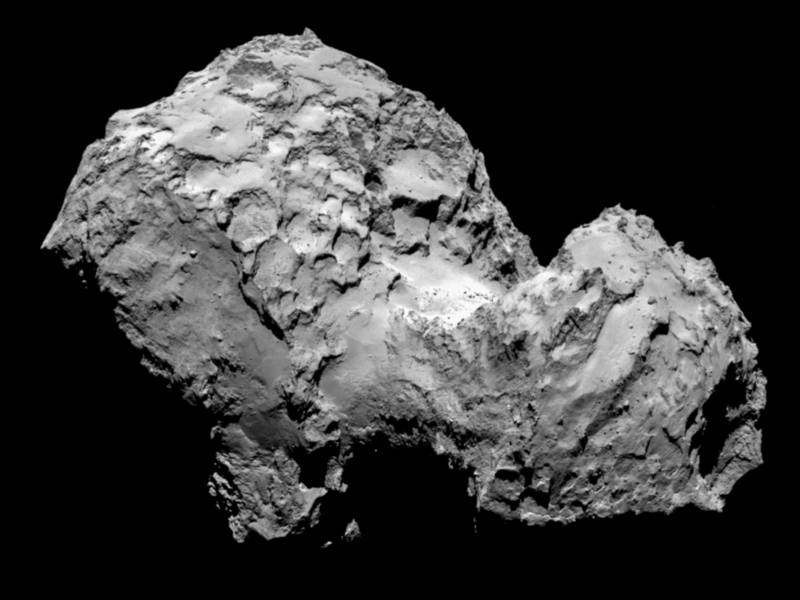 The apparent “death” of little Philae. Sad to watch but expertly managed by the team at ESOC, the bittersweet moment arrived where battery charge was exhausted and Philae went into stasis – all systems powered down into standby or “idle mode”. 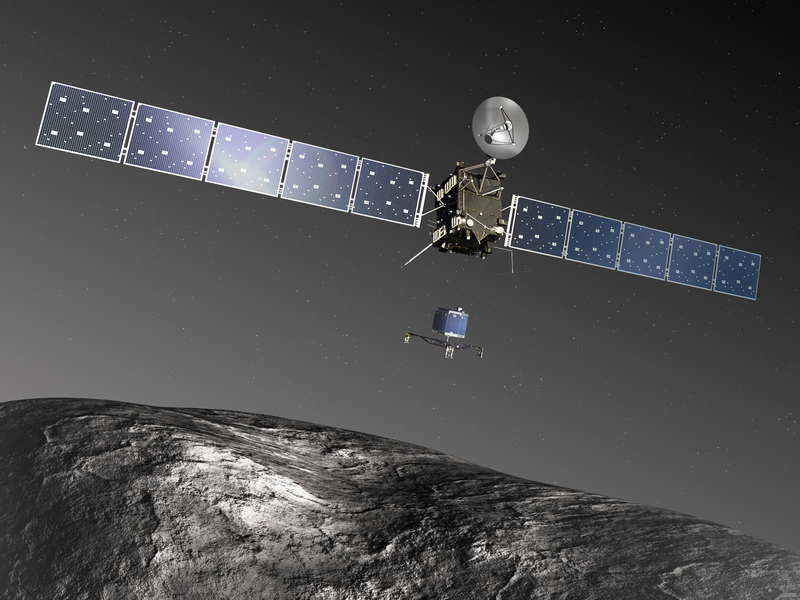 And according to the ESA Rosetta project director, it might not be over yet ! It has been suggested that as the comet gets closer to the sun, there is a chance that little Philae may yet awaken as more sunlight falls upon is solar panels. Only time will tell and for now its down to the scientists to process the amazing amount of data gathered by the lander in its short active period on the surface. But what now? ….is there more? ….what comes next? Is there a legacy of such a marvellous achievement that can be built on? I believe most strongly that the answer is YES! I really hope that the afterglow of such an amazing project is long lasting and bears fruit in the form of further and sustained interest in not only space but in the wider arena of STEM related subjects. Last year, at the very end of November, the world of space and science revelled in the spotlight for a while as comet C/2012 S1 (ISON) passed close to earth, passing round the sun, only to disappear in a few lingering wisps of cometary debris. 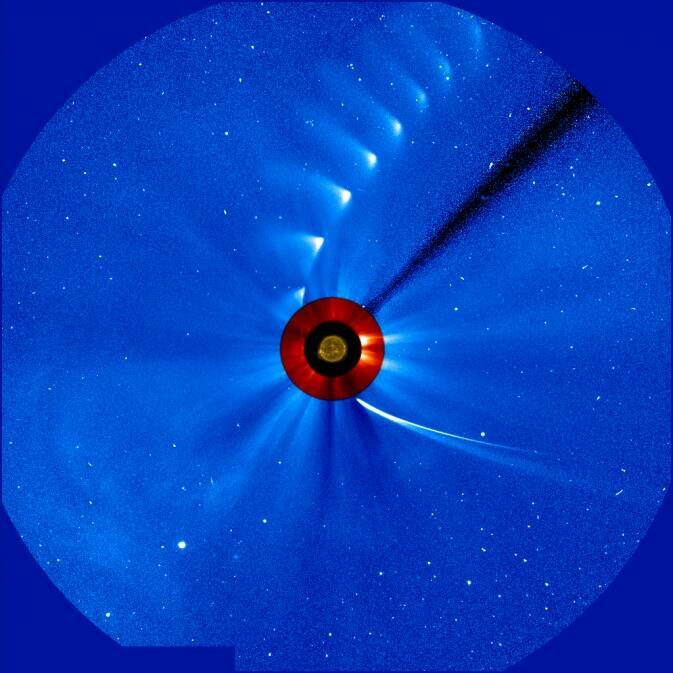 Comet ISON’s pass round the Sun. During this perihelion pass, I (like many others) was glued to a multitude of scientific newsfeeds from NASA, ESA and other users in my own twitter feed. For the self-confessed astrogeek in me, no Hollywood blockbuster even came close to the will it or won’t it debate! For a short period of time comet ISON captured the imagination of the world’s media, both social and mainstream, and gave a huge boost to the place of science in pop culture. This was however, shortlived (as usual) and science soon returned to its comfortable old armchair at the back of the hall. But there’s a newcomer on the horizon! Another opportunity for science (and space in particular) to be thrust back into the limelight, and it comes in the form of a well travelled space probe called Rosetta. Artists impression of the Rosetta spacecraft. Launched in March 2004 aboard an Ariane V, the Rosetta mission has taken over 10 years to reach its goal – another comet! This one, called 67P/C-G (Churyumov–Gerasimenko), is a large icy rock that completes its eliptical orbit of the sun once every 6.45 years. After it’s incredible journey into the outer solars system, Rosetta reached the comet on 6th August 2014, becoming the first spacecraft to go into orbit around a comet. Close up detail of comet 67P/Churyumov–Gerasimenko. Lets just take a moment here to let this sink in …… we’ve successfully managed to launch a space probe, guided it to perform four gravity assist manoeuvres (around earth three times and Mars once) to gather enough speed, precisely calculate the position of a lump of rock and ice in the vastness of space, wake the space probe after ten years in sleep mode, in order to not only greet the comet at over 600 million km from earth but enter into orbit with the nucleus at a distance of just 30km! Scheduled for the 12th November, the second part of the Rosetta mission gets underway and involves a passenger that Rosetta has carried on its epic journey. No a passenger in the form of a person but a small robotic lander called Philae. This will detach itself from the main body of the spaceprobe and, if all goes well, achieve something that has never been achieved before, a controlled decent and landing on a cometary surface. WOW! Artists impression in the detached lander “Philae” on approach to the comet’s surface. Immediately after touchdown Philae will deploy harpoons to anchor itself to the cometary surface and commence a series of scientific experiements to look at the comet’s surface and sub-surface composition as well as the plasma and magnetic environments of the nucleus. For some people,that will not be exciting at all. For others (myself included) it will be an incredible feat of science and engineering and marks a spectacular acheivement in space exploration. No mater into which camp you fall, I just hope that the mainstream media give this endeavour the attention it deserves. Now that all the excitement has died down a little, I felt it only right that poor old ISON got at least one blog post from me, to commemorate its passing. I, like many others (my fellow astro-obsessed people), watched intently the journey of comet ISON over the last couple of weeks of November to today in early December, culminating at the very end of November (perihelion on the 28th) in ISON’s passage around the sun and thence to its final demise to naught but a wisp of dust and particles (although speculation still abounds!). A time-lapse image of comet ISONs perihelion. This information above probably comes as no great shock to anybody. Anyone into space and astronomy was watching. I feel I have to comment on the unpresidented activity that ISON’s slingshot round the sun caused. I for one was glued to my twitter feed, the helioviewer website and the NASA and ESA feeds of LASCO, SOHO and STEREO data. It was joyous to behold ! ….. but not because of ISON itself but of what it caused. The huge level of interest in this space based phenomena. A surge of tweets and posts, as so many like-minded science lovers looked on, and speculated, postulated and discussed. But it became more than just the science community, for a time ISON entered the domain of the common man and sought to complete almost as a celebrity. It was trending on twitter, discussed on local radio stations and given plenty of attention in the national media and television. How wonderful that science could be brought to the fore and engage so many people by the travel of a lump of icy rock that began its journey from the very farthest reaches of our solar system over a million years ago. C/2012 S1 (ISON) ….. I salute you !